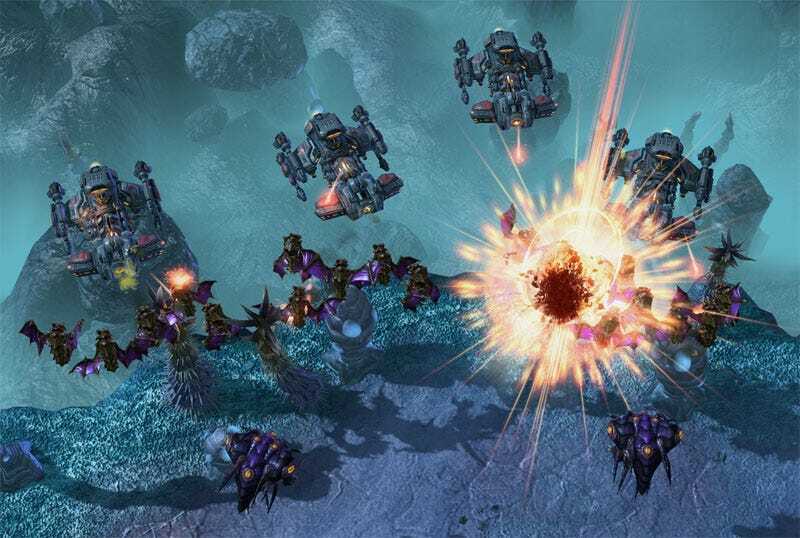 Real-time tactics evolve with StarCraft II: Wings of Liberty, Blizzard's long in the making sequel to one of the most beloved, bestselling sci-fi strategy games of all time. Oh, so you've heard of it, then? Three distinct races, the displaced humans known as Terrans, the ancient, mystical alien Protoss, and the insect-like Zerg horde, are (still) embroiled in an intergalactic war. Billions die as the Zerg swarm reawakens from hibernation four years after the events of 1998's StarCraft: Brood War. In StarCraft II: Wings of Liberty, players will largely experience the Terran side of this story under the command of Jim Raynor, hero of the original StarCraft and now enemy of the imperial Dominion forces. Raynor and his faithful crew of Raiders hop from planet to planet searching for artifacts that may end the Zerg's reign of terror and that of its leader, the Queen of Blades. Of course, that's just a small slice of what StarCraft II: Wings of Liberty has to offer. In addition to the lengthy story-driven campaign mode, there's a deep multiplayer component, a revamped Battle.net matchmaking and social service, plus a robust game mode editor. Was it all worth waiting more than a decade to play? As Good As Sci-fi Space Opera Gets: StarCraft II's single-player campaign story engages and satisfies—even if we only peek at a third of this game's arc in Wings of Liberty. After waiting far too long to revisit the heroic Terran marshal Jim Raynor, the tragic Ghost-turned-Zerg queen Sarah Kerrigan, and their respective conflicts with the sleazy Emperor Arcturus Mengsk, it was StarCraft II's single-player campaign that I anticipated most. It does not disappoint. The story meanders as Blizzard dispenses some missions that serve as tutorials, some as experience-awarding filler, but it never loses sight of its looming climax. Raynor's crew and shipmates always have something interesting to say about their situation, some insight that will flesh out their character. Wings of Liberty's story blends humor, tragedy, mystery and intrigue into something worth playing through, ending on a thrilling note. The expansion StarCraft II: Heart of the Swarm cannot come soon enough. Fine Mission Design: Over the course of Wings of Liberty's 29 campaign missions—I actually wound up playing through 26 of them to reach its end—rarely does a mission feel rehashed. Some worlds are flooded with lava every few minutes, some spawn unstoppable armies of zombie-like Zerg at night, some require stealthy gameplay and demand careful unit management. Almost all are memorable and filled with alluring bonus objectives and challenging, elective achievement-based skill tests. There are no duds. Decisions, Decisions: As Wings of Liberty's story progresses, the player is faced with some hard choices. With whom should Jim Raynor ally himself? Who to trust in this war in which billions of lives may be lost? Blizzard was more than effective in making me second guess each pivotal decision. While the interactive portions of StarCraft II's story may have been conflicting, choosing which research items and troop upgrades best suit my play style was much easier. While collecting relics and earning cash by taking jobs, Raynor will be given the chance to evolve his troops, buildings, vehicles and ships in compelling new ways. The impact of these decision making moments makes Wings of Liberty playing through more than once (or at least saving your game frequently). Adventure Lite: I'd hesitate to label the in-between moments spent on the Battlecruiser Hyperion an adventure game or a role-playing game. It's not that deep, But clicking around Raynor's spaceship environment was a treat. Speaking with non-player characters and surveying the ship's armory, lab and cantina was infinitely better than the alternative from the original StarCraft. Instead of watching talking heads explain why Planet X needed to be infiltrated, rich characters engaged in conversation, exposing aspects of their personality that made them memorable. The Campaign Remix: There are creative unit and ability additions in the single-player campaign that can't be experienced elsewhere. Familiar units from the original StarCraft that were left on the cutting room floor, like the Terran Medic and Firebat, are alive and well here. The addition of specially powered Mercenary troops that players can hire further lends StarCraft II's story-driven side a feeling of looking at the director's cut of the game. It can be a little unsettling to play through Wings of Liberty's campaign and then dive into multiplayer, where your tech tree and tactics will need to be relearned, but the wild variety here is an enlightening look at the chances Blizzard was willing to make. Old Units, New Tactics: Some StarCraft standbys appear virtually unchanged in the sequel, like the gruff Terran Marine and the Zerg Hydralisk, essential to any army. But small changes to these units and bigger alterations for new or evolved ones open up exciting new tactical opportunities. Chokepoint strategies are rendered less useful by the Terran Reaper and Protoss Colossus, which essentially ignore terrain. The Zerg Infestor, which can possess enemy units, and the tactic of moving Zerg units that remain cloaked underground wildly changes how old units must be employed. Tried and true tactics, like Zerg rushes and micro-managed Terrans Siege Tanks, can still work, but players will be required to think differently about how they're employed. StarCraft II may not go far enough in shaking up the formula, but its less obvious changes can have substantial impact. 3v3, No Waiting: Getting into a multiplayer game of StarCraft II is smooth, streamlined and speedy. It's also fair, thanks to matchmaking rankings that have resulted in closely contested matches more often than blowouts. StarCraft II's interface for finding, creating and joining a versus game is easy for those who just want to hop into a skirmish, but also customizable enough that playing on the map of your choosing with the Battle.net friends of your choosing is a snap. Browsing custom games and player-created maps is straightforward, making it simple to get in, get out, a deliver your opponent a "GG." Play It Again, Jim: A far more helpful tool for improving one's StarCraft II's game than its tutorials and player guide are post-match stats and replays. After a win or defeat, players can save replays of matches to review another player's build order or understand how they built their tech tree. This is a great tactical equalizer and should be explored by new players thoroughly. The Lure of Achievements: I love achievements as a learning tool—the game regularly encourages you to play it on harder difficulties—and StarCraft II's virtual rewards do an expert job of making playing smarter more rewarding. The campaign and challenges become more appealing to revisit thanks to numerous achievements across game types and dozens of unlockable avatars and decals. The 12 Year Half-Step: For all of its polish, its technical accomplishments and its masterfully told sci-fi story, there's an inescapable feeling of StarCraft II being stuck in time. While still thrilling, the gameplay side of StarCraft II feels less innovative than it does derivative. That's more of a product of the original StarCraft's ingenuity, which was dazzling for its remarkable balance between three distinct races and its massive, species spanning story. Wings of Liberty is also a harsh reminder that the majority of StarCraft II's story is yet to be told, an even more painfully long wait to see this chapter unfold. StarCraft II: Wings of Liberty comes with its share of nits, including its lack of true local area network play, its demands for an internet connection to play—though campaign and solo missions can be played offline—and its comparatively tame progression in terms of real-time strategy gameplay. The rest of what Wings of Liberty brings to the table far outweighs those pesky complaints. It's stuffed with a great story, nearly limitless gameplay opportunities and a finely balanced, competitive playing field. The greatest thrills, after the impact of Wings of Liberty's powerful story has sunk in, remain online. Other players are crafting unique maps and experiences with StarCraft II's Galaxy Map Editor, pumping out mods that turn the strategy game into a shooter, a platformer, a kart racer and more. Other players are simply waiting for a competitive or cooperative challenge, ready to surprise you with new attacks and counterattacks, frustrating and impressing you with their ingenuity. StarCraft II is still a game of micromanagement, build speed and base management, playing with and against forces you're mostly familiar with in a theater of war that certainly feels less fresh than it did in 1998. But Blizzard has polished that classic real-time strategy gameplay to a brilliant shine, offering a single and multiplayer experience that is unmatched. The long wait was worth it, if only to kick off another long wait to see how StarCraft II ultimately ends. StarCraft II: Wings of Liberty was developed and published by Blizzard Entertainment for the PC and Mac on July 27. Retails for $59.99 USD. A copy of the game was given to us by the publisher for reviewing purposes. Played single-player campaign to completion on Normal difficulty, played half of the game's Challenges and played dozens of multiplayer matches in the multiplayer beta and final versions of the game.